Local teams are gearing up for next week’s playoff action with many teams ranked in the top 10 in their respective divisions, including Mira Costa boys soccer, girls soccer, and girls water polo along with Redondo girls basketball, girls soccer and girls water polo. Redondo’s girls basketball team (No. 5, Div. 1) had a 19-game winning streak end Saturday with a 61-39 loss to visiting Sierra Canyon (23-0), the top-ranked team in the state. Redondo (22-3, 9-1) was led by senior Dylan Horton and sophomore Calli Stokes. 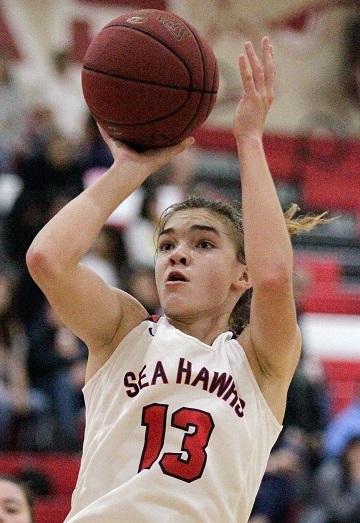 On Tuesday, the Sea Hawks ran over Peninsula 75-46 and will finish Bay League action with a 6 p.m. game against rival Mira Costa on Thursday. Mira Costa (17-9, 6-3) rallied from a 15-point deficit to defeat Leuzinger 56-55 in double overtime on Friday behind Skylar Herdman’s 13-point performance, all coming in the second half. Mira Costa proceeded to beat Centennial 59-33. The Mustangs will finish in at least a tie for second place, which will have a bearing on the upcoming playoff seedings. With the Bay League title on the line, Redondo (19-8, 7-2) was upset by Peninsula 46-39 Tuesday behind JD Plough’s 18-point performance. Peninsula (17-10, 7-2) plays at Palos Verdes (21-4, 6-3) Thursday evening while Redondo hosts Mira Costa (16-10, 5-4) in a 7:30 p.m. contest. Redondo rallied to defeat host Palos Verdes 51-46 Friday when Mike Solimando nailed a 3-pointer then stole the ball with less than one minute to play. Pairings for the boys and girls basketball playoffs will be available on Sunday after 12 p.m. at cif-ss.org. Mira Costa’s girls soccer team (20-5-1) is ranked No. 5 in Division 2 while Redondo (23-4-2) holds the No. 10 position, but in the season finale on Wednesday, Redondo handed the Mustangs their first league loss of the season. Redondo finished in second place in the Bay League, securing the 2-1 victory behind the strong play of sophomore goalie McKenna Morey who recorded six saves, including one with 30 seconds remaining in the game. Redondo had goals by Celine Gehrig and Sophie Crouts. Redondo is coming off a key 3-1 win over Palos Verdes, in which Sophie Crouts scored a hat trick. Saige Stock had two assists and Tanner Calahan recorded one. 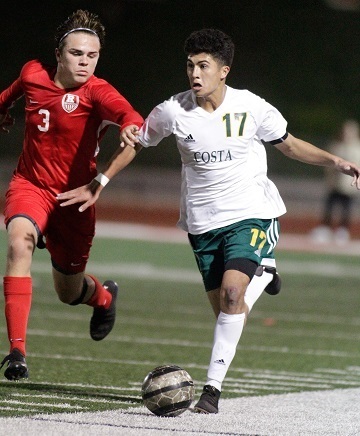 In boys action, Mira Costa (18-0-3) is ranked No. 3 in Division 1 and came back from a 3-2 deficit in the second half to defeat Redondo (17-8-1). Ian Sinkowitz and Josh Gaudiano posted goals within two minutes to lead Mira Costa. The Mustangs were coming off a 3-1 comeback win against Leuzinger on Friday. It marked the first goal surrendered by the Mustangs in five games, but goals by Pedro Rodriguez-Borlado, Gaudiano and Max Haber preserved the win. Redondo rebounded from a 1-0 loss at Palos Verdes with a 4-3 home victory against Peninsula on Monday. The win secured second place in the Bay League for the Sea Hawks. Pairings for the boys and girls soccer playoffs will be available Saturday after 11 a.m. at cif-ss.org. Teams from the Bay League hold three spots in the Division 3 top ten led by Mira Costa at No. 3 followed by Redondo (No. 4) and Palos Verdes (No. 10). Bay League action concluded Tuesday when Mira Costa (16-9) rallied to defeat Redondo (18-4) in an 8-7 come-from-behind victory to capture the title. With only 57 seconds remaining, Dylan Reed scored to even the game at 7 apiece, then Leigh Lyter scored the game-winner with 30 seconds left on the clock. Mira Costa was coming off competition in the SoCal Championships held in Irvine. The Mustangs lost to Schurr 10-3, defeated Long Beach Poly 11-6 and Murrieta Valley 7-6 before losing to Harvard-Westlake 12-6. Redondo was led by Tarah Schaffer who recorded five goals in the loss. Last week, Redondo coach Shelby Haroldson notched her 100th career win with a 13-3 victory against Peninsula. Sabrina Dimesa and Kennedy East scored three goals apiece while Caylah Olay added a pair in the victory. Brackets for the girls water polo playoffs will be announced Saturday at 9 a.m. at cifss.org.